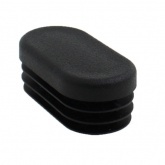 These multi-purpose oval flat ribbed inserts, end caps, chair leg protector, chair feet, pads, tips, are ideal for protecting your floor from damage and scratching. Previously our customers have used them on the bottoms of chair legs, ironing boards and table legs. Ideal for Church Halls, Schools, Nursery Chairs & Nurseries, Banqueting Chairs, Restaurants, Cafes, Function Halls, Dining Rooms & Kitchens Chairs.